The main entrance to Kuala Lumpur Bird Park. Kuala Lumpur Bird Park is very interesting, because not only is the Kuala Lumpur city center filled with buildings and shopping centers, but it also provides many interesting tourist destination. During the school holidays, many may want to bring their family visits to places of interest around the city of Kuala Lumpur. 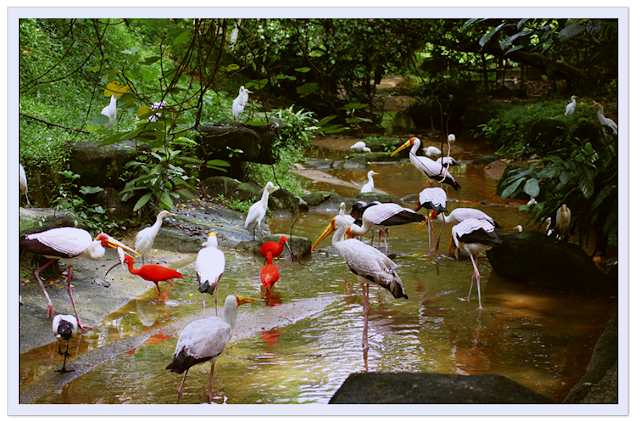 For those who live near or travel to Kuala Lumpur, Kuala Lumpur Bird Park is one of the must-visit destinations. 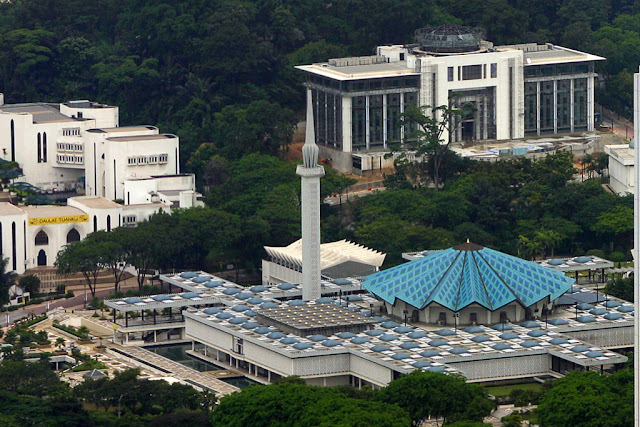 Located in Taman Tasik Perdana, it is also close to many other parks like Taman Orkid, Taman Bunga Raya, Butterfly Park, National Planetarium, the Islamic Arts Museum, Deer Park and Memorial Tun Razak. So if you want to visit this place you may visit more than one park at the same time - it saves time and travel costs. The park is easily accessible using your own vehicle or by public transport. Situated close to the Kuala Lumpur railway station and you just have to take a taxi with approximately 5 minutes. Similarly, a driver for routes around the Lake Gardens is not as busy as in other major routes. GPS location of the park is N3 08 581, 41 294 E101 to assist your navigation. Cute birds enjoying sunflower's seeds. One of the landscape at the Bird Park. The best thing about this bird park is that it is said to be among the largest in the world. Divided into different zones, Zone 1 and Zone 2 (Zone 3 is the hornbill cages and Zone 4 for few other small cages) you will see varieties of birds fly freely around the park designed to resemble their natural habitats. There are also small cages which housed birds such as parrots, eagles, hornbills and others to enable you to see it up close. This is because it is difficult for you to see these birds if they are allowed to fly free in the main cage that is too large. Through visiting this place you can see rare birds that you discover as you also learn more about their habitat and how they live. The surrounding that resembles their real habitat can be another important thing to take note on how these birds survive in the wild. Want to have a picture with the birds? If you are lucky you might catch a peacock showcasing its beautiful tail’s feathers. Peacocks are moving freely in the garden and their feathers also look healthy (not damaged by captivity). Similarly for other birds such as flamingos that manly spends their time in the artificial pond. Crown pigeons are among many other birds that roaming the park. Apart from seeing these birds you also have the opportunity to take pictures with the birds that are specially trained to pose for picture. It consists of parrots, eagles, owls and the most special is the hornbill. Yes, I've had the opportunity to touch the hornbill and it's very docile. Time to eat! You can watch this too. There is lots of information signage that describes the names of birds that you can find around the area. So you need not to worry if you can recognize their names. There are also exciting activities around the garden and the learning that help kids learn more about the world of birds. So this park is ideal for birders and also for the whole family. To fully enjoy the experience here, you have to spend at least half day for an area of ​​the park is ​​20.9 acres and filled with areas that resembles different habitats of birds. There are approximately 3,000 birds from 200 species from different part of the world.